New research has concluded that children who have good nursery or other pre-school education do better at primary school than those kept at home. University of London researchers also found differences in the performance of children from poorer homes. The Effective Provision of Pre-School Education project has been tracking the progress of more than 3,000 children since they were three. Clear evidence has emerged now the children have reached the age of seven. The EPPE project was funded by the Department for Education and Skills. In the study, the first of its kind in Britain, the children were tracked to find out how different sorts of pre-school educational care would affect their development. The group's standardised test results offer clear evidence that those who were kept at home performed worse in reading, writing and maths than those who were not. Children from poorer families who were kept at home until they were ready for school failed to reach the standard expected for their age in reading and writing tests. Those who had pre-school educational care were slightly above the expected level, the researchers said. 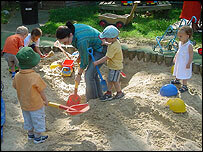 Pre-school experience enhanced all-round development. The earlier children started, the better in terms of their intellectual development. Full-time attendance led to "no better gains" than part-time. But there were significant differences between the type of provision, and quality was important. Integrated centres combining education and care, and nursery schools, both with a higher proportion of trained teachers, had higher quality scores than playgroups and private or council-run day nurseries. The effects weakened over time, so that at the end of national curriculum Key Stage 1 - usually when children are aged seven - the effect was stronger for academic skills than social development. The report also says that for all children, the quality of home learning is more important than parental jobs, education or income: "What parents do is more important than who parents are." The Children's Minister, Margaret Hodge, said: "There has been a lot of concern expressed by parents, raised by research, as to whether it is damaging to have your children in pre-school. "I think, I hope, this research today gives comfort to parents who are always worrying about whether they are doing the best for their children and how to balance work responsibilities with care at home. "Pre-school on the whole is a really good thing. It is not a substitute for good quality parenting in the home but certainly it does not have the damaging consequences that have been suggested by some commentators and researchers based on questionable evidence." The Effective Provision of Pre-School Education (EPPE) Project, University of London Institute of Education.